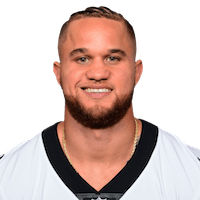 The Saints waived Lasco (neck) on Wednesday, Josh Katzenstein of The New Orleans Times-Picayune reports. Analysis: Lasco was an exclusive-rights free agent after he spent the entire 2018 season on the Physically Unable to Perform list with a bulging disc he initially suffered late in 2017. The 26-year-old is apparently healthy after the extended absence and will look to find a new team for 2019. Lasco (neck) has resumed running routes while wearing a helmet, Luke Johnson of The New Orleans Times-Picayune reports. Analysis: Lasco last saw NFL action in November 2017 before suffering a bulging disc in his neck. The injury has kept him on the PUP list throughout the 2018 season, but his recent activity suggests he could be restriction free by the time OTAs commence this spring. Lasco (neck) cleared waivers and was moved to the Saints' Physically Unable to Perform list, according to the league's official transaction log. Analysis: Lasco was waived Wednesday after failing his physical earlier in the week. While he's now back with the Saints, the team hasn't provided a timeline for when Lasco will be back in action. Lasco (neck) has been waived by the Saints, Josh Katzenstein of The New Orleans Times-Picayune reports. Analysis: Following a failed physical, the Saints are cutting ties with Lasco to free up a roster spot for veteran pass-catching back Shane Vereen. The 2016 seventh-round pick played jus 38 snaps in 2017, all on special teams. He was placed on injured reserve in mid-November after a scary collision caused a bulging disc in his neck and a concussion. Lasco (neck) officially landed on the Saints' injured reserve Tuesday, Nick Underhill of The Advocate reports. Analysis: Lasco suffered a bulging disc in Sunday's victory over the Bills, which will require him to miss the remainder of the season. There is no report on how long his recovery is expected to take, but the running back will have to put his sights on a 2018 return. Lasco suffered a bulging disc in Sunday's game against the Bills and will miss the rest of the season, Ian Rapoport of NFL Network reports. Analysis: There was serious concern when Lasco was taking off the field in an ambulance, but after the injury was deemed to not be life-threatening, it's even better news to know that it also isn't career-ending. There's no report as to how long Lasco will be recovering for, but the expectation is that he will be able to make a full recovery. The running back was primarily used on special teams this season. Lasco (neck) has full motion in all of his extremities and will undergo further evaluation Monday, Josh Katzenstein of The New Orleans Times-Picayune reports. Analysis: The Saints received terrific news following Lasco's injury. At first glance, there was no telling how severe the injure was. But, following preliminary tests, we can exhale a sigh of relief knowing the neck injury isn't life-threatening. As of right now, there is no timetable for Lasco's return. Lasco was taken off the field in an ambulance during Sunday's matchup with the Bills, Chris Brown of the Bills' official site reports. Analysis: It was a scary sight in Buffalo, as Lasco had his head and neck stabilized on a backboard before being loaded onto the ambulance. The injury was sustained on kickoff coverage, and hopefully Lasco is able to recover quickly. There are no videos available for Daniel Lasco. Click here to view all videos.